BELTON — The shush age of libraries is over. Now it’s time to figure out what place libraries have in this smartphone era. That’s the question the city of Belton is attempting to answer for the Lena Armstrong Library. The city has brought in Library System and Services, a private library management firm based in Maryland, to find that answer. 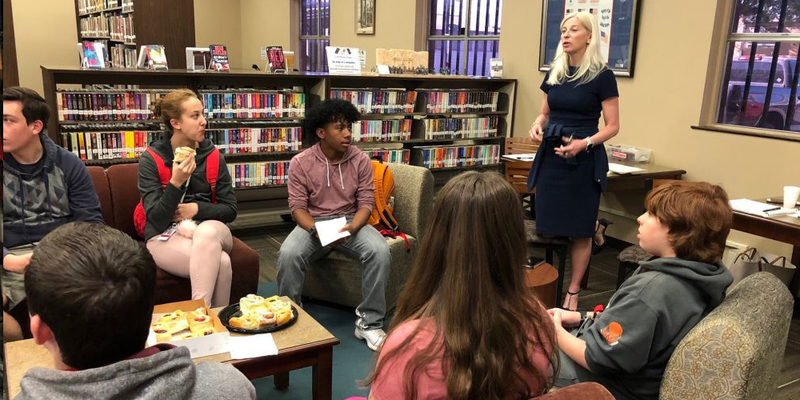 Throughout Thursday, city officials and Library Systems and Services consultants met with various groups — from Belton New Tech High School students to City Council members — to begin to unravel what this city needs from its public library. “When you think of all the services you offer your community, this service is undervalued,” Jennifer Giltrop, chief library officer for Library Systems and Services, told three Council members. Libraries, Giltrop said, are the greatest democratic institutions in communities. It serves all people from all walks of life. The Lena Armstrong Library is in the vein of a traditional library. You get your books and go. “It’s what we grew up with,” Giltrop said to Mayor Marion Grayson, Mayor pro tem Craig Pearson and Councilman Dan Kirkley. Kirkley grew up visiting the Carnegie Library, the original library here, with his mother. Those visits were special, but one thing always stood out. Pearson learned the Dewey Decimal System through his frequent visits to libraries during his childhood and military career. Technology is changing libraries, Giltrop said. For instance, libraries have ditched the physical card catalog, replacing it with a website. Many libraries have even bucked the stereotype of a librarian telling visitors to quiet down. That includes the Lena Armstrong Library. Libraries are attempting to become the third place — the surroundings that people have beyond their home and work. The Lena Armstrong Library has operated in its current building since 1975. New Tech students agreed with Giltrop’s assessment of the library environment. They want more natural lighting, comfortable seating and a space where they can meet classmates to work on homework together. What the teenagers want, consultant and architect Kathryn Taylor said, is a welcoming and open environment with a variety of spaces. “The space limitation does not welcome staying. Period. It just doesn’t,” Giltrop said. Pearson agreed that space is a constraint for Belton’s library. If possible, he would like to see a larger library that becomes a community hub — something Belton lacks. But Pearson was not sure how Belton can accomplish turning the Lena Armstrong Library into that community hub. Grayson thought the library already met the community needs. That may be the case for this Central Texas city, said Deborah Joy, the library marketing director for Library Systems and Services. But it’s also a story she has encountered before. Library Systems and Services worked with a rural library that met its community’s needs. Then the city found funds and built a new library. Demand surged after that, she said. “After kind of being steeped in Belton for the past month or so, that’s what it’s kind of starting to feel like here,” Joy said. There are some changes that can easily be implemented that may draw more people to the library. Residents have approached Grayson to tell her their only complaint is the library’s hours. The mayor suggested tweaking the hours so parents and their children can visit the library at a better time. The city will need to adopt new strategies to educate residents of what their library offers, Joy said. The library’s website should be fleshed out more, Grayson said. The site should explain what residents can do at the library and what they can access online through the library, she said. Additionally, the library should begin offering programs to draw more people, the mayor said. The program can focus on genealogy, how to repair common household appliances and other unique topics to draw people who may not have visited the library to check out books, Grayson proposed. “Maybe they’ll see the library in a different light,” she said. Libraries, Joy said, are focused on one thing.